Six pieces. Pastry triangles stuffed with herbs, garlic, green beans, and carrot. Served with chutney. Red lentils cooked with onion, coriander, turmeric, chilli, and tomato paste. Spiced with cinnamon and herbs. Potatoes cooked with onion, garlic, ginger, tomato sauce, turmeric powder, and yoghurt. Spiced with herbs. Spinach fried with vegetable oil, onion, shallots, and garlic. Flavoured with chilli and herbs. Chicken pieces cooked with onion and tomato paste. Flavoured with chilli and herbs. 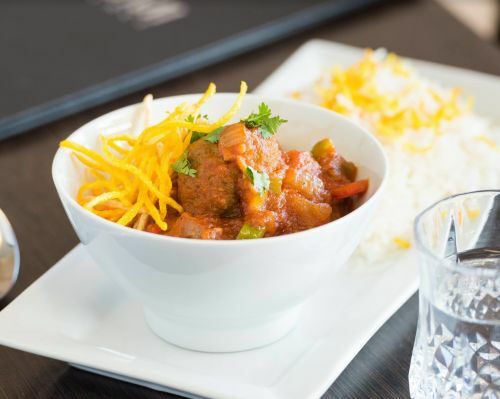 Served with your choice of naan or rice. Pearl barley and rice cooked with chicken stock, herbs (parsley, spinach, chives, dill, and coriander), beans, and lentils. Topped with yoghurt. Cumin and cardamom flavoured basmati rice decorated with fried carrots, sultanas, silvered almonds, and pistachios. Fried eggplant with onion, tomato paste, coriander powder, turmeric, and garlic, topped with yoghurt and dried mint. Fried dumplings stuffed with chilli and leek, topped with lentils and yoghurt. Steamed dumplings stuffed with lamb mince, chilli, and cabbage leaves, topped with lentils and yoghurt. Lamb mince meatballs with chilli, coriander, and herbs cooked with tomato paste and served with steamed rice. Lamb shoulder cooked with onion, turmeric, black pepper, cinnamon, and ground saffron. Served with ghabli palaw. Two pieces. Skewers of marinated lamb mince, onion, and saffron, served with basmati rice and grilled tomato. Marinated chicken grilled with onion, capsicum, lemon juice, and saffron. Served with basmati rice and grilled tomato. One skewer of kebab koobideh and one skewer of joojeh kebab, served with basmati rice and grilled tomato. Lamb shoulder cooked with onion, turmeric, black pepper, cinnamon, and ground saffron. Served with a blend of mixed rice, dill, and broad beans. Lamb shoulder cooked with onion, turmeric, black pepper, cinnamon, and ground saffron. Served with plain basmati rice. Hot black tea with milk, sugar, and cardamom. Topped with cinnamon. A cold Persian beverage made with yoghurt, salt, water, and dried mint.